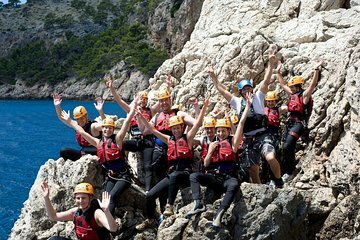 Get your adrenaline soaring as you shimmy along rocky ravines, abseil down sheer cliffs and dive into startling blue lagoons on this fun-filled 4.5-hour tour from Mallorca. Zip up your wetsuit and prepare for a daring cliff jumping adventure in the heart of the UNESCO-listed Serra de Tramuntana mountains, leaping off cliffs and ledges into icy plunge pools. This small-group tour is limited to eight people and includes full instruction, so there’s no experience necessary. We collect from most main resorts please contact us if you are unsure. Climb aboard an air-conditioned minivan at your Mallorca hotel and travel deep into the UNESCO-listed Serra de Tramuntana mountain range. On arrival at base camp, don your wetsuit, secure your harness and listen to a safety briefing from your instructor. Once you feel confident, embark on your cliff jumping adventure and let your adrenaline levels soar. Alongside your instructor, you’ll abseil down rock faces, leap from cliffs into natural pools and soar through fast-flowing streams — enjoy a moderate or exhilarating experience depending on your skill level and preference. When your heart rate returns to normal, go back to your vehicle and gaze at the Serra de Tramuntana during the journey back to your Mallorca hotel. We went with a group of four and had such a great time. The guide was very patient with us and incredibly helpful. We did cliff jumping first - starting with a 3M jump and increasing from there. When we got to the higher jumps, we did zip lining and let go into the water. Then he gave us the option to scale the rocks with our arms. We opted out but some of the men in our group did it. Highly recommend this excursion for the adventure seekers. Incredible views from the location they take you to.